Definition of Islamophobia then: irrational fear of, aversion to, or discrimination against Islam or people who practice Islam. But wait, all of that is true, and is well documented throughout the trilogy of Islam known as the Koran, Hadiths and Sunnah (SIra). 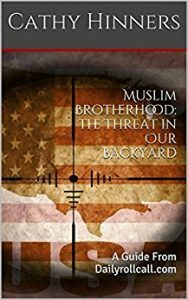 Islam has been, and still is violent, alien, or I would say antiquated, and certainly does not urge the assimilation of Muslims into Western culture.The prophet Muhammad was, in his early Meccan years a peaceful, pious man, but upon his inability to convert the masses, he became a political, murderous thief. What Muslims like Beydoun want the world to believe, is America is a racist society, that somehow has been transformed due to the election of a President that wants to make our country great again. This idea seems to be offensive to Muslims, since their ideology calls for everything that is antithetical to our way of life. Muslims believe in redistribution of wealth, that all people are unequivocally equal, and their beliefs are supreme. That is where the hypocrisy lies. In Islam, there are two classes of people..Muslims and dhimmis. Dhimmis must follow the rules of Islam, and pay a tax called jizya. If they cooperate, Dhimmis are allowed to practice their faith, and are protected by the state. Another fantasy Beydoun has created is three dimensions of which he labels “private Islamophobia; 2- structural Islamophobia, and; 3- dialectical Islamophobia.” “Private” Islamophobia is considered the fear of Islam, perpetrated by those who mis- characterize Muslims and others like Sikhs. Structural Islamophobia comes from the government in the form of laws and bans against Muslims, and dialectical, which basically reiterates the prior two. What Beydoun doesn’t tell in his long diatribe, is the truth. The word Islamophobia was created by Muslims to be used as a label which would deter people from speaking out against, or opposing Islam. Labels are known to harm people in the way of losing their job, family members, or friends. Like any other term though, over time it loses is meaning and effectiveness, so other definitions or words are created. Now, according to this article, Islamophobia is no longer a fear of Islam, but an entire structure of society filled with a population that is hateful, and loaded with supremacy. White supremacy. Oh please! It isn’t Islamophobia that is dangerous, it is those calling for its demise who are. ← Previous Previous post: TN Dept of Education Urges Students To Participate in Walkouts. Next → Next post: Nashville TN Police Chief Exposes Cadets To Radical Mosque..Again.